It’s a much bigger cast than just the trio. 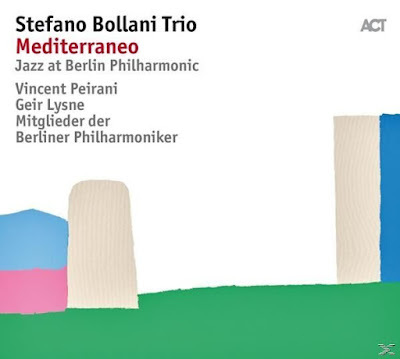 In addition to Italian pianist Stefano Bollani and his pair of Danes, Jesper Bodilsen on bass and Morten Lund on drums, we hear Frenchman Vincent Peirani on accordion and accordina as well as 14 members of the Berliner Philharmoniker, all playing music arranged by Norwegian Geir Lysne. This is the 17th in the Jazz at Berlin Philharmonic series of concerts which attempts “to put the ‘Sound of Europe’ on the big stage. This time Italy is the star, not just because of Bollani's charismatic presence at the centre of everything, but because the music delves deep into the riches of Italy’s past, from Claudio Monteverdi through Giacomo Puccini, Gioachino Rossini and Ruggero Leoncavallo to Nino Rota, Ennio Morricone and Paulo Conte/Michele Virano. The trumpets and other horns of Berliner Philharmoniker herald the start of the concert, playing the Toccata from Monteverdi’s L’Orfeo, leading dramatically to powerful opening chords from the trio in the Sinfonia from the same opera with explosive solos from the Berlin Phil’s violist Martin Stegner, Bollani and Peirani, the 14-piece mini-orchestra giving them a good run for their money throughout. The switch to a solo piano interpretation of Rota’s theme from Federico Fellini’s film Amarcord is a gorgeous contrast. Were any two musicians more perfectly suited than Rota and Bollani? The party-like encore is more Rota, this time the marching theme from Fellini’s Fortunella, the orchestra giving its all in a jam-packed, rambunctious two minutes. Before then we’ve heard Morricone’s Chi Mai given a Monty Alexander-style reggae treatment with lush orchestral support, The Good, The Bad And The Ugly with delicate expressiveness from Peirani, and a third Morricone piece adding tension and drama so that it can be blissfully undone in Conte/Virano’s cantering Azzurro. Bollani is as suited to Conte’s world as he is to Fellini’s, and there is a fine bass solo from Bodilsen. The double whammy of Puccini’s O Mio Babbino Caro and Leoncavallo’s Mattinata gets the piano trio swing treatment leading to shimmering strings, the full orchestra and Peirani adding urgent interjections over the top before the horns and Bollani leads into a beautifully voiced, and beautifully measured, denouement and back to the start. Rossini’s Largo al Factotum, from The Barber of Seville is the concert climax with everyone having a ball and Bollani offering a teasing cadenza. This kind of big, celebrity concert with a grand sense of occasion and some kind of contrived overarching theme can, in subsequent recording, leave one responding: “Hmm, maybe you had to be there”. But when it works, one’s response changes to: “Damn! I wish I’d been there!” This album is definitely worthy of the latter response. Stefano Bollani is playing in a quartet setting in the Cadogan Hall as part of the EFG London Jazz Festival on Saturday 18 November at 7.30pm.